"Whitten used extensive interviews, and the records allowed to him to tell a cautionary tale on how the destruction of our world could come from complacency, lack of control, miscommunication, and politics. Weapons have massively improved but not human beings." At no time in the history of the world has the end of humanity become such a real possibility as the intersection of the Cold War and the Nuclear Age. During the 1950s, the United States and the Soviet Union developed hydrogen bombs, long-range bombers, and inter-continental missiles. America, however, had no "intelligence collection assets that could penetrate the vast regions of the Soviet Union." 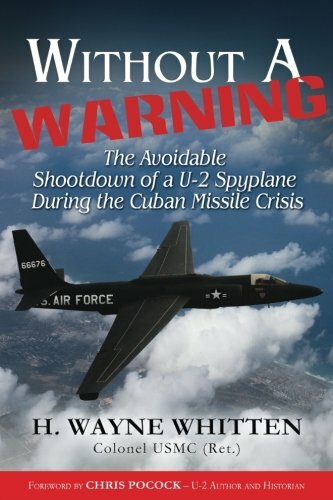 The photographs made by America's U-2 spy plane played a major role in what happened in the crucial 1960s and what might have happened but especially during the Cuban Missile Crisis "when the nation was put on a war footing." Even in our age of satellites, U-2 historian Chris Pocock writes that the U-2R "will remain in service for many years to come." Recognition of the significance of that period has come while participants still live. All sides kept and keep extensive records, although author Col. H. Wayne Whitten "naively under estimated the obstacles posed by the Freedom of Information Act." Soviet missiles shot down a U-2 at 70,000 feet on May 1, 1960. On August 29, 1962, however, a flight over Cuba, led to exposing nuclear weapons in Cuba. The Cuban Missile Crisis ended when the "Soviet Union and Chairman Khrushchev had backed down and agreed to remove the missiles." On the 12th day of this 13-day crisis, a U-2 went down. Colonel Whitten writes about that forgotten incident: "I decided to publish my findings, express my opinions, and leave it to the reader to decide if the tragic loss of Major Anderson could have been avoided." The United States had previously lost U-2s to Soviet SAMs. By the time of the above loss, "overflights were limited to in and out short segments" and "peripheral flights in international air space were added." The loss of Major Rudolph Anderson, Jr., the only casualty of the Cuban Missile Crisis should not have happened. The military command in Cuba, with the blessings of the ruling Castro brothers, fired on the U-2 without orders on October 27, 1962. Khrushchev in Moscow may have only first learned of the shoot down from an American public announcement. "Military necessity had finally overruled political concerns." On the American side, among other problems, the Strategic Air Command took over the U-2 missions. It "failed to coordinate timing and flight paths" and "was short of resources to support the demanding flight paths." To that, Whitten also points to "a degree of complacency, a lot of coincidences, and plain bad luck" with "intelligence failures and questionable command discussions." Major Anderson died from system's failure, not as the result of a treasonous conspiracy on either side. Kennedy and Khrushchev "knew events were spiraling out of their control and the risk of a thermonuclear war hung in the balance." This incident threatened to end the peace effort of the two nuclear-armed nations. The drawback to books like these, to paraphrase a quote about submarines, is that sometimes the people who publish the most know the least about the subject. Critics, including this writer, have the same problem in writing our reviews. In Without a Warning, the author uses his extensive experience as a Marine Corps pilot during the unappreciated war between American aerial photographic reconnaissance, radiation detection, and electronic surveillance versus Soviet air missile (SAM), advanced radar, and other defenses. Whitten used extensive interviews, and the records allowed to him to tell a cautionary tale on how the destruction of our world could come from complacency, lack of control, miscommunication, and politics. Weapons have massively improved but not human beings. Without a Warning tells a concise, gripping, informative tale without confusing the reader with technical detail overload. In a previous book, Whitten wrote the history of the forgotten Marine Corps "low-level photo missions in RF-8As with their Navy counterparts" over Cuba. The book has structural problems, however. Major Anderson needed an introduction earlier in the story.